Greetings, everyone. This thread is created, instead of posting time to time on different topics, all posts will be merged to one topic. This post consists of subway lines with cars in appearance and yard(s) with changes. The car and yard assignments were referenced by joekorner. -145 St on the line is the only station that requires the amount of cars that can open at that station. -The now transitioned to using only R62A subway cars in-passenger service. 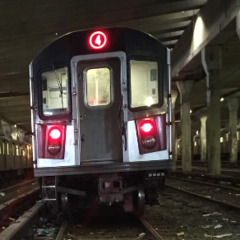 - The with the R62A subway cars will stick around longer till CBTC is active. - A Jamaica Yard train is used on the during AM Rush to Coney Island from an train to 96 St-2 Av. This also notes that only one train starts at Bay Ridge-95 St to 96 St-2 Av via 63 St because of ridership along Second Avenue. -The uses a R68/A from the AM train that ends at 145 St on the upper level for the PM rush till the end of the night. - The can be seen in two type of 8-car trains: R32/R160A-1: 8 62 ft trains with 8 75 ft cars of R46. - The R179 is currently in-service on the . This makes 5 different type of trains on this line. The total for the is 430- 43 trains. Total count for the 42 St Shuttle is 24. R32s are Budd, not St. Louis. R42s are St. Louis. Also Add to the fact that 4 Trains from Mosh Yard, Is Stored In Concourse Yard on track 17, 17a, 17b, and 17c! 3454/3455 is actually 207th Street’s Cars again. That’s been on the for weeks. Those R142A’s at Westchester don’t run, don’t they. I believe it’s only 15 cars. *Unless CBTC is active on the , it'll probably move but as of now, it stays quiet. Are they concerned about the mileage on those cars specifically? Update to the 42 St Shuttle: 3-car trains will have the middle car, middle spot as the seatless area. Kawasaki R62 1456-1460 is back on the (3). Saw it earlier coupled to 1576-1580. Did they move 7071-7125 from the to the ??? Is this because the received R142A cars from the ??? Or maybe it’s a strategic move and they’ll mothball it to wait until they need more service to do an in-house CBTC conversion. Not sure if you're aware or not, but photobucket hasn't shown your countdown clock in quite some time.